"Thank you. I just receive the order today and it was some excellent coins. I wanted to thank you for the order and how everyone has worked with me. Thank you very much." "I'm glad I bought all of the variety books from you guys. So far, I've found a 1950-D/S Quarter and a 1912-S Nickel and a 1901 Double Die obverse Morgan dollar. The current batch I'm still looking through and doesn't appear to be as rich, but so far I have found a 1909-S Indian cent. Although dark and ugly, Beverly Hills Numismatics offered me $150 for it. Not bad for a coin that I paid less than a dollar for. Thanks." "Thank you very much for another winner!! I resold most of the 10,000 coins in two months, with about a 35% profit overall and 2,000 more coins that I kept for myself ! Enclosed find a check for 20,000 of your "Old Coin Bulk Lots" (.98 cents per coin)"
"Thank you for another great lot. I won't tell you what I found but I think the enclosed check will show my gratitude. I've been ordering bulk lots and surprise packages from many sources for many years, and I confess that I tried out a few other places after I bought from you. But I keep coming back to you because yours are the best by far. Keep up the good work and I'll keep sending the checks. I and my kids love searching through all the goodies every time your "care packages" arrive. Thank you again." "Looking forward to receiving my order of 200 Morgan Dollars, VF-AU, your coins never disappoint! 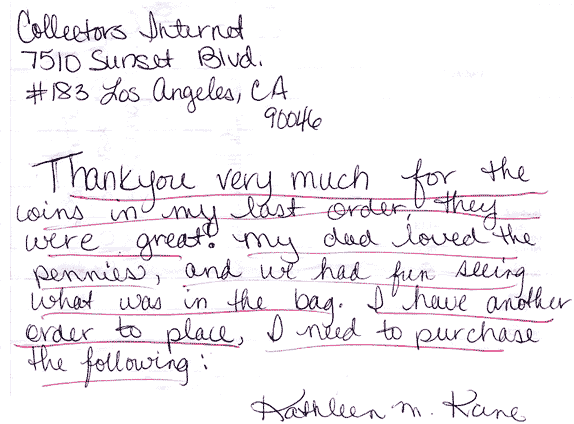 "I was pleased with the contents of my penny bag and will be ordering more." "I should also add that this is my third order with you good folks and I have been very pleased with the coins I have received so far. "Thank you very much for the coins in my last order, they were great. My dad loved the pennies and we had fun seeing what was in the the bag. I have another order to place." "Over the years, I've ordered from about a dozen dealers on the net.. I've narrowed it down to two and perhaps one. Your firm consistently delivers the best quality and value for the past seven years now, and you always have the best selection. Enclosed find my 10th, larger order for 10,000-coin Wholesale Bulk Lot. The last nine contained many keepers and I even found a 1936 Double Die cent.. Thanks again"
" I received the 300 coin purchase - thank you. I want to order a larger quantity of coins this time. My intention is to keep a few nice coins and sell the rest on E-bay and make a little bit of money." Beautiful lustre and strike. If any more come your way, let me know. The coins I am getting from you are great (4 orders came in last week). I referred you to a friend, who put in an order for 1,000 of the "bulk lot coins" also. Thanks again for the great coins. as you are regarding customer service. great success finding great "keepers"
them on the internet, local consignment auctions, etc. "I have received my 1922 plain and I am very happy with it. I feel that it was just slightly under graded. (A pleasant surprise since most dealers tend to overgrade). I have been collecting Lincoln cents since 1968, and now my set is finally complete. I also have all the proofs from 1950 to 2002 along with most of the doubled cents. Without the 1922 plain my set appraised for $20,000. Thank you for helping me to finish this set. You will here from me again soon, because I have also been collecting Franklin halves, so now I can concentrate on finishing that set also." "I have dealt with several dealers who advertise in Coin World and on E-bay and find that their grading is inferior and that they are very unprofessional. After years of experience, and spending thousands of dollars on coins in the mail, CollectorsInternet and a dealership in New England are the only two coin dealers who I wish to do business with. Keep up the good work. Your grading and prices are always better than expected." "Thank you again for another great coin for another great price. This is the 43rd coin that I have bought from you guys, and it is adding up to a great Morgan Dollar set. Thanks again." "Just a note of gratitude for helping me and my grandson assemble a nice collection of Large Cents. We began buying from you back in 1979, and haven't regretted a single transaction. We've won several awards at the local coin shows, and have you to thank for it. Keep up the good work!" 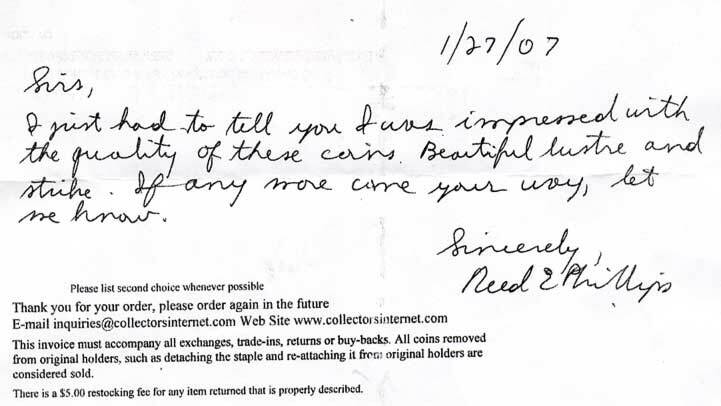 "I have recommended CollectorsInternet to all my buddies at the local coin club, and they all say they are just as happy as I am. We're all tired of losing our shirts and wasting time on the other on-line auction sites. You're one of the best dealers around. Enclosed find my fifth order this year." "Thank you, I've enjoyed all the coins received so far. Keep up the great work." Praise : Super Nice Coin THANKS!!!! Praise : SELLERS DELIGHT! MY HIGHEST RATING TO YOU! IT'S BEEN A PLEASURE! THANK YOU!! Praise : Very prompt, great to deal with, 21stcenturycds.com thanks you! Praise : You won't find a more reputable seller on eBay. Thanks! Praise : excellent transaction!! Thank You!!! Praise : great coin. good communication. pleasure to do business with. Praise : Excellent seller, no problems, highly recommend to others. Praise : NICE TRANSACTION & COIN.VERY FAST DELIVERY .THANKS ! Praise : Very nice coin just as described. Reliable ebay seller. Praise : It took awhile - but it was a great looking coinn-Thanks!!! Praise : Smooth transaction. Would recommend. Thank you! Praise : good communication-nice coin- good to do business with. Praise : Good transaction. Thank you ! Praise : very happy with this coin best i have bought on e-bay!!!!!!! Praise : Thank you, Great Coin, A Happy Customer!!!! Praise : Great ebay seller. Goes to extremes to satisfy buyers. Great deal and coin. Praise : Fast service Grading right on. Praise : Fast service Grade right on. Praise : Coin could have been a little nicer for the grade. Praise : VeryProfessional. Quality,Service,Communication: A+ WillShopAgain. Thanks! Praise : Nice coin. Very with the transaction. Praise : Beautiful Coin Quick Delivery A+ would do business with again! Praise : good coin, good service. Neutral : Check cleared 8/30 Refund issued 9/26 I'm impressed. Try marketing excuses! Praise : Recieved coin, very nice. Praise : FAST. iTEM AS DESCRIBED. Praise : Awesome coin, better than expected, would buy from again w/o hesistation! Praise : Nice coin and Timely transaction. Thanks. Praise : AAAAAAAAAA+++++++Always great coins at great prices. Sold for a profit.